Rayson Esquejo is an entrepreneur working in Social Media Marketing, Rayson Media, LLC, FAHMLA, and Eat Play Move. Based in Los Angeles, Rayson has worked in media, loves meeting and working with all kinds of people, and is one of the founders of Los Angeles’ Original Filipino Angeleno Food Festival: Eat Play Move. The event’s overwhelming success and support from the LA community encouraged Rayson to work on producing this year’s event, a more streamlined event with amazing food vendors, a stage of performers, alcohol area, and awesome photo ops. Rayson’s warm and friendly demeanor, coupled with hard work and sense of community, has produced an uplifting event for Filipino American History Month in LA. 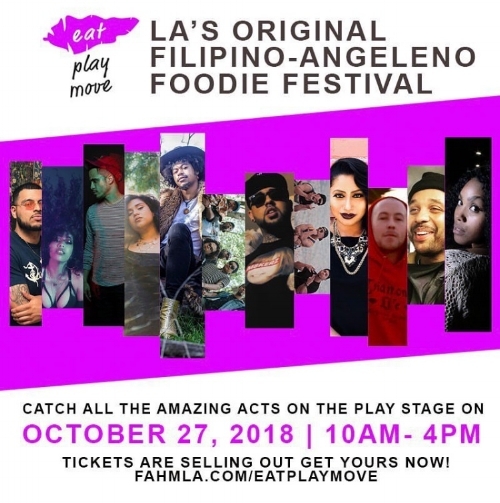 Eat Play Move is Saturday, October 27th in Downtown LA’s Arts District. Eat Play Move’s Rayson Esquejo and Lauren Delgado, and Fox LA’s Maria Quiban and Bobby DeCastro. By doing the things that others would not want to do. Were you always involved in Filipino food? No, but my family was very connected to a lot of Los Angeles' community organizations, but food and specifically Filipino food has been very recent. How did the idea for Eat Play Move come to fruition? My partner and I were having dinner one day, I brought up the thought of throwing a food festival (thinking the concept wasn't very complicated). She works in politics and is very tied into the Filipino Community and noted that she was planning on throwing an event for Filipino American History Month. We both discussed merging the two, and came up with a Filipino food festival. I get to meet and interact with so many kinds of people! 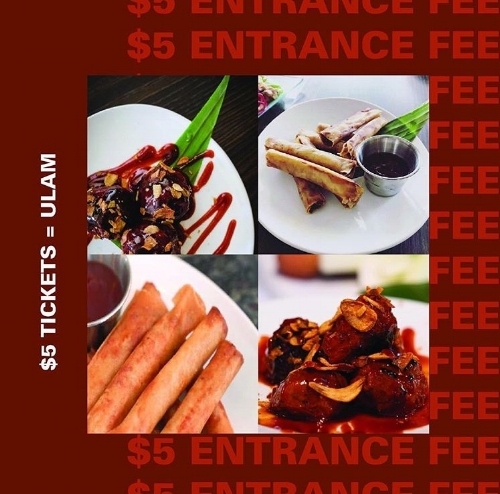 What was the response to having the first Filipino food festival? How has the Filipino American community come out and supported you? OVERWHELMING! So many people LOVE food in LA and a lot of people are very curious about Filipino food. We're glad we can bring those two worlds together. Since we started this last year, the community of DOERS in the Filipino community of LA has rushed to support. Especially after they saw all the success from last year's event! Are there certain details about Eat Play Move that you are especially excited about? THE FOOD. Definitely, the food. Other than that, I think I'm really excited about refining the process. Last year was a HUGE event with 25K people, this year I'm really excited to create a better experience for all the attendees! We have some fun photo ops, great food vendors, an awesome alcohol area, and a stage full of talent. We've met a lot of great people in the cooking community, especially the vendors. Their chefs are extremely ecstatic about what we're doing! Actually, this year, one of the Filipino chefs of MASTERCHEF sought us out to be a part of the EPM team! What are your favorite places to eat around the LA? LA has some of the best mom and pop places in the US! Johnny Pacific is great for empanadas, Mariscos Jaliscos is great for shrimp tacos, hot chicken from Howlin Rays, sushi from Poke Motto, Armenian food from Mini Kabob, Filipino food from ALL OF OUR VENDORS, the list is literally endless! What are some of your favorite Filipino dishes? Filipino food is so tasty, I love it all! Obviously, a pork adobo, lechon, and mechado are on the top! Do you have any other projects you are working on/excited about? Working on a ton of different projects on the marketing agency side (Rayson Media, LLC) and as well as throwing more events with our non-profit, FAHMLA, which we started when we put together the first Eat Play Move!